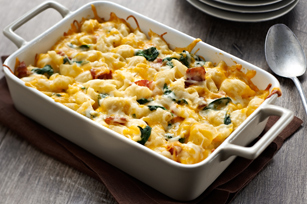 This pasta casserole is made with macaroni, Cheddar cheese and bacon - the perfect combination! Baked until bubbly, this dinner casserole is sure to be a weeknight winner. Cook macaroni in large saucepan as directed on package, omitting salt and adding spinach for the last minute. Meanwhile, cook bacon in large nonstick skillet until crisp, stirring occasionally. Remove bacon from skillet; drain on paper towels. Discard drippings from skillet. Add onions to skillet; cook on medium heat 3 to 5 min. or until crisp-tender, stirring frequently with whisk. Stir in flour; cook and stir 1 min. Gradually whisk in milk. Bring just to boil, stirring constantly; cook and stir 3 to 5 min. or until thickened. Stir in 1 cup cheese; cook and stir 3 to 5 min. or until melted. Add bacon; mix well. Drain macaroni mixture. Add to sauce; mix well. Spoon into 2-L casserole dish; top with remaining cheese. Substitute 3 cups small broccoli florets for the spinach, adding to the macaroni cooking water for the last 2 min. Stir 1/2 cup chopped tomatoes into macaroni mixture before spooning into casserole dish.